As part of the ArtSites service, we create email addresses using your "official" domain name. We then forward any messages sent to those email addresses to an email address of your choice. However, if you want to reply using your "official" email address, you will need to make a few changes to your email setup and preferences. 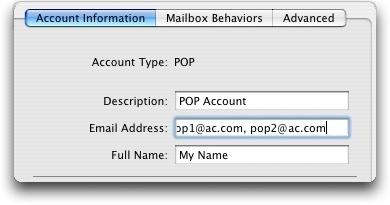 Here are the instructions on how to create "alias" email addresses, using Apple's Mail application. Select 'Preferences' from the 'Mail' menu in the upper-left corner of the application window. Click the name of your EXISTING Mail account. If you only have one account set up, it will select itself automatically. Click in the 'Email Address' box on the 'Account Information' screen (see below). Move your cursor to the end of the current email address(es). Type a comma, then add one (1) of the email addresses we have created for you. Repeat Step 6 until you have added all the email addresses created. Make sure that there is a comma between each email address. Click the red 'X' button in the upper-left of the window to exit 'Preferences'. When prompted, click 'Save' to save the changes you made. Click the 'New Message' button in the Mail window. In the 'From' field, a drop-down menu appears that lists all the email addresses available to your account, including your new email addresses. Select the one you want and the message will send from that email address. Feel free to send us a test message to make sure everything is working as you wish.